One of the biggest challenges for many school districts is motivating teachers. How do I know? One of the most frequent search terms we have identified on k12hrsolutions.com is the question “How to motivate teachers?” This question has slowly risen near the top of all search results on the site over the past five years. This caused us to ask, are teachers that are entering the classroom today less motivated than teachers in years past? Or, do school leaders need to reflect and look within their organization to identify potential roadblocks to employee engagement? Research on motivation, autonomy, and employee engagement suggests it’s the latter. IKEA, a company that is synonymous do-it-yourself practical furniture, may be able to teach schools something about how to motivate teachers. What is the IKEA Effect? In the study, the researchers examined how people viewed experiences and items they felt they created versus items that were pre assembled and made for them. The researchers focused on creative, build-it-yourself brands like Ikea and Legos. Mochan and Norton found that people who assembled their own items developed more of an affinity or perceived value for the pieces they created compared to those who just purchased items that were premade. 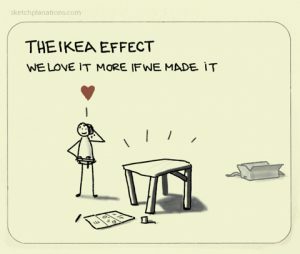 The IKEA Effect seemed to create more motivated customers who valued their contribution in creating the product. As they looked further they noticed the IKEA effect was also found in food and even toys. As you read through this article, consider how school district organizational practices relate to these product designs and the research on the IKEA Effect and how autonomy and creativity can be used to help motivate teachers. The 1950’s was the advent of the instant food era. Companies developed marketing strategies aimed primarily towards American housewives that promised “instant” baking products. It turns out that instant wasn’t the immediate success product manufacturers thought it would be. Companies like Bisquick discovered people wanted to feel they contributed to the finished product. They wanted to do more than “just add water.” Simple steps like adding an egg or measuring a half a cup of milk and oil changed how people perceived their contribution to cooking a meal for the family. Four decades later a company called Build-a-Bear followed the same model. Kids line up for the opportunity “make” their own stuffed animal and cherish their creation more than any of their other toys because they helped make it. Anyone that has ever made a Build-a-Bear stuffed animal knows kids aren’t really making the stuffed animal. They have the opportunity to customize the toy and be a part of the creation process. When researchers Mochan and Norton examined business examples of Bisquick, IKEA, Legos, and Build-a-Bear they noticed a pattern. People value experiences and develop an affinity for items they felt like they created more than items that were pre assembled and made for them. While instant and done-for-you may be easy, it didn’t seem to be related to feelings of value or engagement. Besides classroom rules and building culture, one of the most common things that teachers can create is curriculum. We are not suggesting schools provide complete autonomy and allow teachers free rein to create whatever curriculum they want. In fact, for many newer teachers, a lack of structure and guidance can result in feeling overwhelmed. IKEA, Bisquick, and Build-a-Bear don’t expect people to manufacture their product beginning with raw materials. They give the customer essential resources, enough structure to get started, and assistance and autonomy to finish the product on their own. Schools should be cautious in trying to implement rigid instructional models and done-for-you, “teacher proof” scripted curriculum. Instead, look for ways to provide teachers autonomy in various aspects of their practice. Curriculum and instruction that provides structured frameworks, yet still allows an opportunity to adapt or personalize is far more likely to keep teachers motivated. Motivated and loyal customers aren’t an accidental result. Factors like confidence in one’s abilities, or self-efficacy are essential to motivation. Research on self-efficacy found successfully completing tasks allows people to feel competent and in control. Conversely, research on failed tasks found that people tend to dwell on tasks they failed to complete more than those they successfully complete, leading to disengagement and lower levels of motivation. Not every IKEA book shelf or stuffed animal at Build-a-Bear looks exactly the same. Instructions by the manufacture move people towards an agreed upon standard for the finished product. Schools are not factories, students aren’t widgets, and teachers need the ability to customize curriculum and instruction to meet the needs of students and establish their own creative mark in their work. School districts that have identified essential standards, trained teachers to align instructional materials and activities those standards, use research based instructional methods that promote student engagement, and implement common assessments throughout the year can achieve the same purpose of guiding the creative process. Before “assembly” begins, teachers and school leaders need to agree on the outcome of the finished product as well as quality assurance measures. As teachers begin, they need to feel support and guidance is available when needed and that it’s okay to make mistakes as they work. As teachers gain experience, their confidence grows, they become more creative, engaged, and value their contributions more. Uninspired or frustrated teachers are often the first to quit. We consult with school districts all over the country helping them improve their hiring practices and develop valid methods to identify effective teachers. These efforts are in vain if schools fail to consider how to motivate teachers and keep them engaged once hired. Motivating staff is more than a jean day or an extra day off work. Evaluate organizational practices to ensure they are promoting teacher engagement. If teacher motivation is an issue among multiple teachers in the building, it is likely something about the school or district practices are affecting their engagement. Consider how the IKEA Effect might be applied in your school or district. Give teachers the permission and confidence to begin the creative process through frameworks, guidance, and feedback. In time, they will build something they can be proud of and the byproduct is teachers who are more motivated.